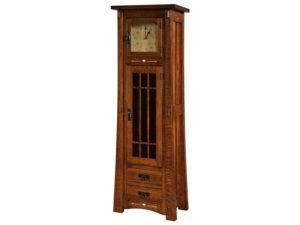 Add character and a sense of nostalgia to your living room or den with a Cabinet Clock from Weaver Furniture Sales. Top Amish artisans custom-craft each of our Cabinet Clocks. And the Amish men utilize the finest hardwoods plus top-quality clock movements. So check out the beautiful, intricately crafted Morgan Clock, McCoy Clock with Door, and the McCoy Wine Rack Clock. The Cabinet Clocks in our collection feature top-quality movements and the finest hardwoods intricately carved by Amish cabinetmakers. The Morgan Clock makes a statement with its beautiful woodwork, mortise and tenon joints, mullion glass door and rustic hardware. In addition, its yellowheart ginkgo leaf and arrow inlays add character and a unique touch. Our McCoy Clock with Door features a beveled glass door with curio light. Also, notice its adjustable glass shelving and two full-extension drawers. In addition, our builders included mortise and tenon construction plus a German-made clock mechanism with dual chimes (with night shut-off option) and a classic Mission style. Then there is the McCoy Wine Rack Clock. It features a 12-bottle wine cabinet, stemware rack and a mirrored back. Plus one full-extension drawer.